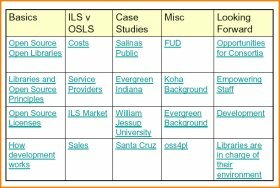 From a session at the 2009 Califa Vendor Fair on the Open Source - Open Libraries Consortium. There was no formal presentation. Instead, attendees were asked to choose the topics to be addressed in the short session. PPT slides were used to help answer those questions. Handouts that were available are included as the last three pages of the attached PDF. Attendees chose the topic to be addressed from this slide.